CHARLOTTE, N.C. (CNS) — A broad digital media project to coincide with Pope Francis’ visit this fall to the United States aims to recruit and interact with young people, particularly those who do not think of themselves as religious. These “nones,” as researchers have called them, are especially found among the millennial generation, generally defined as those who came of age around the year 2000. A 2014 Pew Research Center study found that the number of people who define themselves as “nones” grew from 16 percent in 2007 to 23 percent in 2014. Among millennials, the Pew survey showed a sharp decline in the percentage of people who say they’re Catholic, in comparison to older generations. In the three older generations the survey considered, 20-23 percent of adults said they are Catholics, but among millennials, it was 16 percent. This youthful, religiously unaffiliated demographic presents a golden opportunity for the Catholic Church’s new evangelization, said Kathleen Hessert, founder of Charlotte-based Sports Media Challenge. Hessert, a parishioner of St. Gabriel Church in Charlotte, is leading a national digital evangelization initiative by the global Catholic network Aleteia.org in conjunction with the pope’s Sept. 22-27 trip to Philadelphia, New York and Washington. A key part of Aleteia.org’s digital strategy is engaging with millennials who — even though they do not identify now as religious — can represent a vital constituency to the future of the church, Hessert said. Often called the “Net Generation” or “digital natives,” millennials were among the first to grow up with computers in their homes, and one of the most popular forms of their media use is social networking. The Catholic Church must use digital and social media to engage with millennials — presenting the Gospel to them in new ways and encouraging them to get involved, she said. 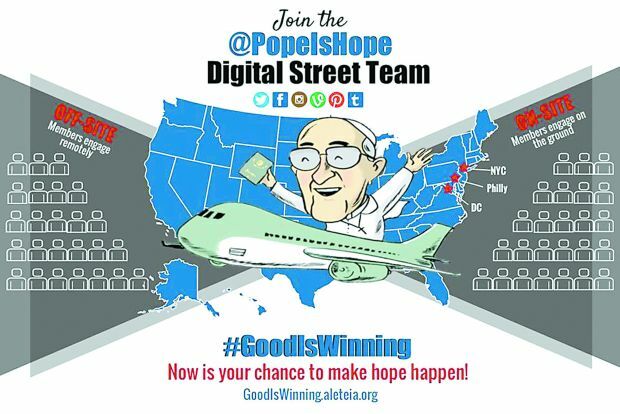 During the pope’s visit to the U.S., Aleteia.org’s digital campaign will spread the message “Good Is Winning,” an effort to highlight acts of mercy, kindness, courage and dignity in everyday life. Communication will include Facebook, Twitter, Instagram and Pinterest, as well as contributions using Vine, Periscope and Snapchat, with top Vine and Twitter influencers being part of the mix. The campaign will use the hashtag #GoodIsWinning. The “Good Is Winning” campaign will be conducted by a “digital street team,” a group of 30 social media-savvy millennials who will shepherd the communications effort before, during and after the pope’s visit. Team members will create and promote stories, photos, videos and conversations in social media to help inspire and inform people about faith, social justice and values. Twenty people will be based at a media “command center” in Philadelphia, with another five in Washington and five in New York. Another 30 members from across the country will participate remotely. Content will be produced and targeted to those who don’t consider themselves religious or who are lapsed from their faith, but who are curious about Pope Francis and interested in what he has to say. The goal is to reach these people — Catholics and non-Catholic alike — during the pope’s visit and start conversations about faith in new ways, opening their hearts to the Gospel, Hessert said. The “Good Is Winning” campaign is expected to reach millions, according to Hessert, based on a similar “digital street team” campaign she launched for the NFL in Canada in 2013 that attracted millions of new fans and followers on social media. Hessert added that the campaign is meant to have longer-lasting results than just building “buzz” around Pope Francis’ visit. Its most important impact will be in the knowledge gained from engaging with people who are casual about their religious affiliation or who have no faith at all. The “Good Is Winning” campaign will compile and analyze data about its online audience and their conversations, with the goal being for the church to better understand millennials and strategically engage with them.